Bershka has released September 2012 lookbook featuring looks for Fall 2012 including the latest trends like wine red and rich blue colors, leather garments like jackets, tops, and skirts and floral prints. 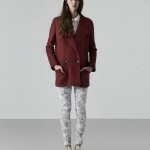 The lookbook showcases such pieces like wine red flora-patterned jeans, floral-printed leggings, peplum floral skirt, studded leather jacket, short bordeaux coat, black leather top, various blouses and jackets. There are a few footwear items featured in the lookbook – black booties, gold foil sneakers and cobalt flats. All of these are easily combined with blue pleated skirt, black blue tops, jeans and leggings. There are also accessories showcased – the metallic collar necklace which looks great with a black leather top, an big studded bag, and a wide-brimmed hat. The embroidered collar trend hasn’t gone anywhere so you can see the two similar blouses with different color trim and decorated collars. The jackets feature leather sleeves and pockets as well as tweed fabric. And the biker leather jacket features studs not only on the lapels and shoulders but also the sleeves.